April 3 Update: Musicians and CSO Association agree to return to table April 5 in effort to end strike that began March 11. The Chicago Symphony Orchestra Association and the Chicago Federation of Musicians have mutually agreed to resume negotiations on a new contract for the members of the Chicago Symphony Orchestra on April 5, the two sides have announced. Management and the musicians remain at odds chiefly over key issues of salary and pension benefits. Among events wiped out by the strike was a March 26 concert at Orchestra Hall by the San Francisco Symphony Orchestra. 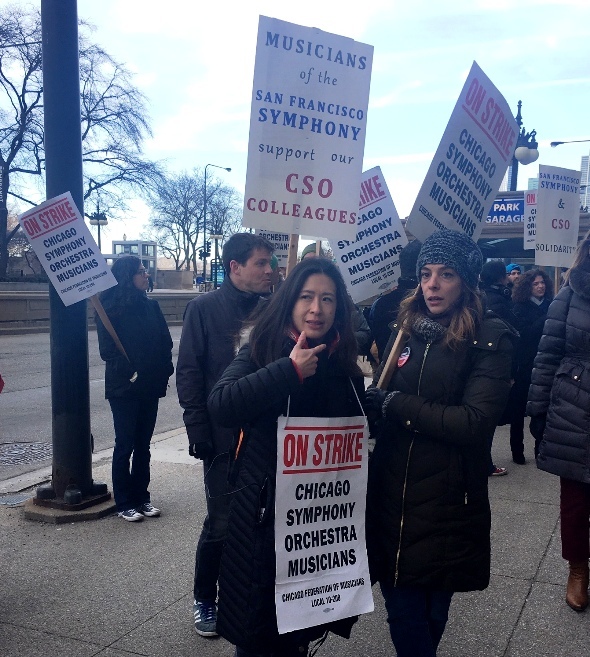 But instead of playing Beethoven’s “Eroica” Symphony, the visiting musicians took to the streets — one could almost say the barricades — in solidarity with their striking Chicago colleagues. 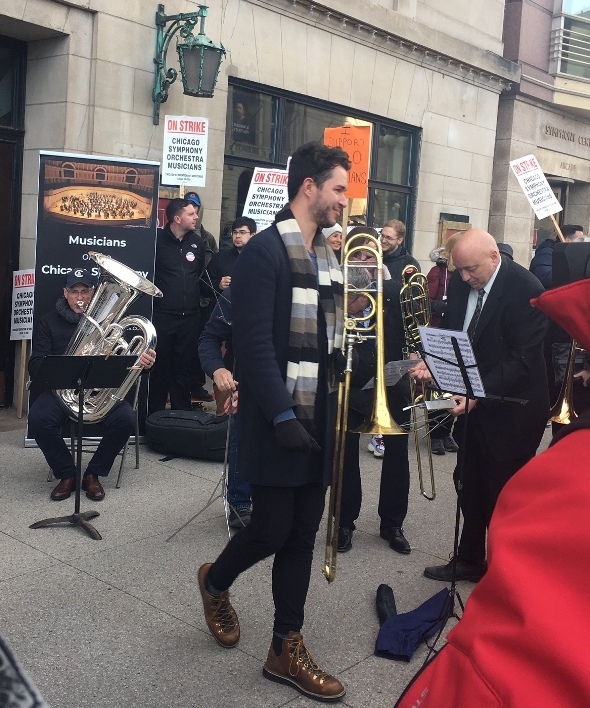 The striking Chicago Symphony musicians invited support. Together, brass players from the two orchestras played briefly on the sidewalk in front of Orchestra Hall amid signs proclaiming their unity. The music mingled with sounds from the streets, as drivers beeped their horns in response to the protest action sustained during daylight hours along Michigan Avenue in front of Symphony Center, where the Chicago musicians usually perform. With no new talks scheduled, the musicians have hosted events of their own, including a packed concert at Chicago Teachers Union headquarters and a steady stream of speakers out front on Michigan, including mayoral candidates and other union leaders. CSO subscription concerts on Thursday, April 4, Friday, April 5, and Saturday, April 6. The program, which was to have been led by guest conductor Jakub Hrůša, with violinist Lisa Batiashvili as soloist. Civic chamber music concert on Sunday, April 7, at the National Museum of Mexican Art. MusicNOW concert on Monday, April 8, at the Harris Theater. Symphony Center Presents Special Concert on Tuesday, April 9, by singer-songwriter Caetano Veloso and his sons Moreno, Zeca and Tom. Meanwhile, musicians of the Chicago Symphony continue to perform free concerts at various venues around the city. On April 1, the full orchestra was scheduled to play at 7:30 p.m. at the Benito Juarez Performing Arts Center, 1450 West Cermak Road. On the program were Beethoven’s Symphony No. 7 and Mozart’s Clarinet Concerto featuring CSO principal Stephen Williamson. CSO trombonist Jay Friedman is guest conductor. The musicians are maintaining a website, a Twitter presence and a Facebook page, where they are responding to comments. Concert photos, a video, and facsimiles of various statements of support from Speaker of the House Nancy Pelosi, conductors Riccardo Muti and Daniel Barenboim and local citizens are available there. 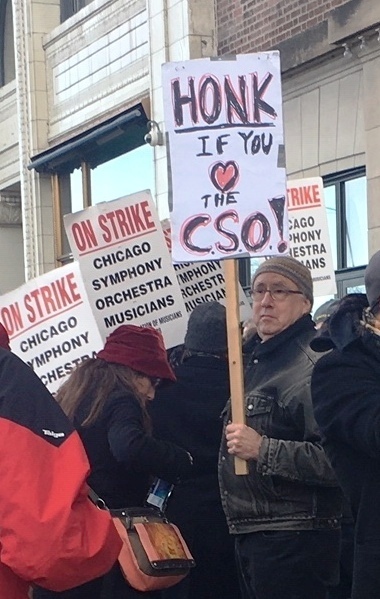 Picketing members of the Chicago Symphony welcomed a show of solidarity by members of the touring San Francisco Symphony.